These days, lots of users are using ArtCursors, as it is one of the best software to create animated cursors for websites and Windows and will help to manage cursor libraries, and for this arrow cursors can be helpful. 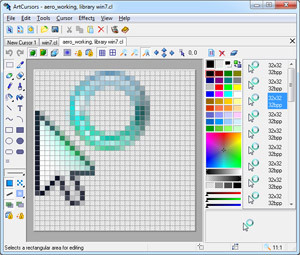 With the help of ArtCursors, you can create different types of stunning cursors for computer and to edit the cursor, you can find cursor editor software. Are you looking for outstanding cursor editor software? Today, if you browse the Internet, you can easily get different types of cursor editor software. It is really difficult for a layman to find one and also not so easy for an experienced professional. You can easily create cursors for computer and can edit it in .gif images. Create animated cursors for Windows XP and other applications. You can store and create images with different layers. You can enhance picture with chess and gradient fill. Aha-Soft ArtCursors will help you to modify images with mirror effects, rotate, colorize, grayscale, rotate, negative, smooth, opacity, shadow and roll. Import cursors from PNG, XPM, XBM, GIF, JPG, WBMP, BMP, EMF, WMF, ICPR, ICO, ANI and CUR. Export cursors from RC, WBMP, XPM, XBM, PNG, GIF, JPG, BMP, ICPR, ICO and CUR. You can easily copy and paste images to different types of applications and libraries. Create arrow cursors and drop cursor images from one cursor to another. You can easily remove duplicate cursors in libraries. This software will help you to collect cursors from folders and other subfolders. So, there are many benefits that you can see in this software it is a must buy for a computer savvy.